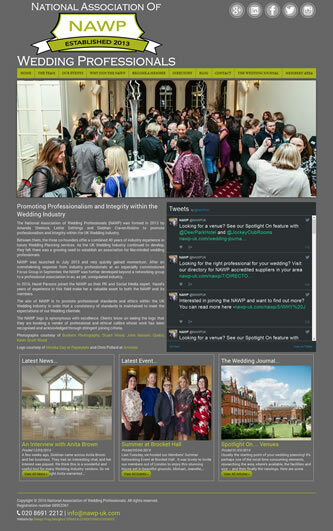 Coverage: The National Association of Wedding Professionals (NAWP) was formed in 2013 by Amanda Sherlock, Lester Gethings and Siobhan Craven-Robins to promote professionalism and integrity within the UK Wedding industry. Specification: The NAWP had an existing website which was created using Wordpress software but was difficult to maintain/update and constantly under attack from hackers. Sleepy Frog Designs created a mobile-friendly website which has all the same features, but is completely custom-coded with a new admin area which is much more user-friendly and secure. The site is dynamically generated through the use of a MySQL database and all aspects can be managed by the owners.